A shrimp boil fundraiser is a creative way to raise needed money for your group. If you're looking for a creative way to raise funds, consider breaking away from selling candy and magazine subscriptions and present a special event that is truly unique and worthwhile. 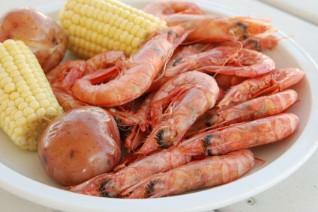 Shrimp boil fundraisers have Southern roots, and are usually held during the summer months. All that this type of event entails is a large pot, shrimp, kielbasa (sausage), potatoes and corn on the cob. You can also connect various other recipes involving boiled shrimp if you wish to deviate from the traditional Southern menu. People purchase tickets and go to the shrimp boil, and all proceeds go toward the group who organized the event. The first step to take when organizing a shrimp boil fundraiser is to have a collaborative meeting with your group. Divide all volunteers into teams: shopping, set up, cooking, clean up. Everyone should have a specific job to do so that your event is well organized, and also so everyone involved feels as if they positively contributed to the success of the boil. After jobs are delegated, brainstorm within your teams to decide what you need to do to pull off your portion of the fundraiser. You can also include some sort of dessert such as peach slices paired with ice cream, or fresh fruit pie. The whole idea is to keep things simple so it will easily serve a large group of people while not costing you a large amount of money to produce. The more income you bring in the better, so keep it casual and frugal, and create an event that people will have a great time at with good, simple and wholesome comfort food. Again, keep it simple, and try to theme your shrimp boil after a Southern style picnic. Red and white checkered table clothes, baskets for the bread, and pitchers of lemonade or apple cider at each table. Don't try to make the cooking "behind the scenes" but rather keep up that family feel and make everything out in the open. It will feel like an open air luncheon you would find after a quaint church service in the South. Your patrons are likely to love the unique and friendly ambiance. Enlist your cooks well ahead of time so you can ensure you have someone skilled and ready for the task of cooking large quantities of seafood. Inform them ahead of time that they will be boiling seafood in with veggies and starch, and make sure they've done their homework before cooking for your guests. The last thing you need is a paying supporter who is dissatisfied with a raw or overcooked meal. Also, make sure your cook and servers portion properly. You can make it a buffet, but then you risk having people take too much or too little - it's better to have cooks dole out the dishes and make sure everyone has plenty to go around. Your cleanup crew is one of the most important teams you'll have. Especially if you have rented a venue for your boil, you want to make sure that everything is spotless and exactly as you found it. Go over with your cleanup crew about their expected tasks, perhaps even taking photos to show them a "before" shot of the facilities. Have responsible adults on hand to make sure that everything is taken care of properly. This type of fundraiser can be loads of fun and can help you raise a significant sum of money. Be sure to promote it to your friends and family at least six weeks in advance to ensure optimal attendance and enjoyment.